My Day. This is my day. I woke up an hour early, squandering the extra hour I was granted yesterday at the close of silly "daylight savings." I crunched across the frozen grass, facing the full moon, overhung by twinkling stars which would not be flooded out. I gathered in my load of firewood, and now the house is warm again. Outside, toward the road from my garage, is the cocoon from which I molted over 25 years ago now. My old wooden boat which has sat under tattered cover these last 6 or 7 years. I'd thought that I could or would find the time to complete its reconstruction. But my work days grew overlong, and my weekends were full of shuttling daughters back and forth to their weekday home in Buffalo nearly two hours away by car. Eventually, the ambition was worn away, and now I would really like only to give the boat away. Craig's List, that beautifully primitive site, brings me surprising numbers of passionate wooden boat enthusiasts, but I fear none of them will take my burden from me. Perhaps my passionate descriptions of this boat's qualities, which I want them to have for free, are that far too improbable. I fear I shall have to hire someone with a chainsaw. And I still do remember living aboard well into the coldest winter on Connecticut's record. Waking to my own frozen breath, and racing then to get the tiny coal stove cheering red again before the stiffening pain in fingers and toes would overwhelm me. Sometimes the wind would reverse the flow down the far-too-short chimney stack, and I would be choking from impossible fumes. Sometimes the early arriving mechanic at the boatyard would run down the dock to see which boat had caught fire at the root of all that black smoke. Most mornings I would win the battle, and then sit back with rough percolated cowboy coffee and another unfiltered cigarette to start my day. I loved the rocking. I hoped for storms. There was a small propellor suspended under my hull to keep the frozen Connecticut River at some remove from this eggshell which protected my tiny envelope of warmth. It sent up unfrozen water which gave my sleep a gentle burbling rocking even without any wind. That was when I started to write. One day when the ice was broken up by howling winds and rain, and I had to go out in bare feet to push the block away that had wedged itself between my boat and the much larger one next dock. 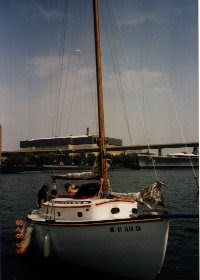 I still remember standing on my bowsprit, the rain so hard that it ran over my toes on deck. I remember waking up. I was at some limit then as now, beyond which there had to be something different. I went below and started writing. I didn't stop for very many hours. I didn't stop until I'd actually solved, through writing, the puzzle in my brain. I hadn't expected that at all. I hadn't even been aware that I'd been praying. Poor Peter, awakened at maybe 3 AM. I'd thought somehow it was a more reasonable hour, but he could see that I needed in. Magically, he set me up with bed and word-processor; one among a very few then on the planet I'm pretty sure. And then I went slowly back to sleep across the years of marriage and teaching and a little bit of leadership. Very little. I knew that what I'd discovered was the very same thing that all writers discover only in their writing. I spent a fair amount of time then, reading. I knew that I had and have none of that talent which true writers have. I am more the scientist, but the burden to write out in scientific prose that thing which I discovered was still further beyond me than the more artistic style of writing I still so much admire. I have been that confident that someone else more talented and harder working, would express in better words than those I had found to cobble together, what it still is that needs to be said out loud. But now, here I am, still absurdly holding on to the shuckings from my awakening. You know, I've sailed that boat in storms and wind which make me shudder still though they didn't at the time. I've had all the life-long pleasures that so many toil after, and feel that they were all granted to me, very nearly without cost at all. This makes me feel blessed, and hardly proud. OK, I'm proud beyond words of my two daughters, but I credit their Mom with that. And here I am again, without ability to carry on in my current manner. And in the meantime, as if for my very own purposes, this weblike cloud has cocooned our very earth which promises also to transform into its butterfly promise. And though there are many many authors now, and filmmakers and poets and musicians and more who would present the world and do that very same insight which I had that day, they present as does my friend and former student at his Subversive Theatre, to a diminutive audience of those few who've already seen their light. Still Pete Seeger strolls along with banjo, awaiting the moment serenely when his fingers cannot pluck. But I search and cannot find my simple insight. I have even had search engines built for my very purpose, and there is nothing out there saying this terribly simple thing. So I must and shall pick back up my thread, and try it all over and over again. This is the day the cocoon breaks apart, my dearest reader. This is the day when light pours through that crack. (this is the first sunny day the whole darned summer, it almost seems) This is the day, entering into winter, when the peepers perversely sing because there is no more time to wait for the springtime warmth. I have nothing other than crudest words. My tools are poorly made and cheap. My boat also should not have sailed this long (take her, please!). But before that large Hadron collider wastes its breath, I must tell you again and again and again that there is no further need to look in that particular direction for more answers. I have no opinion, by the way, about what will get discovered when that collider finally runs. I only know what already has been. I have no desire to pull any rugs out from under world-class scientists who are my truest heroes all. I have a far simpler desire, to outline what has already resolved itself into my view, so that you may see it too. This is not some new conjuring from nothing of something there only in my designing mind. I have no inventive powers. This is a paradigm shifting, properly, which will place into better perspective all the scientific labors which we still must bring to bear on life's issue. And I'm very afraid that there is not a moment to lose. But I am no longer terrified. The thing is simply this: that mind and matter both must be seen to coexist, neither one nor the other taking precedence. There has been much misconstruing of the physics of quantum electrodynamics (I've always wanted to throw that term around, but quantum mechanics would work just as well) to promote or refute the notion that the measuring mind has actual impact on what gets measured. That's wrong. That's a misconstruing of the problem of Schroedinger's cat. It is not our perception which collapses the probability wave. It is the rubbing together of all such waves, such that they already exist, these supposed particles or strings, in the conspiring together of so unthinkably many of them. One alone would fill and be the entire cosmos. But one alone could exist only in some mind. We have brought our minds to the very brink of abstraction now, which is itself an enactment of insanity, to determine what in essence, minimally, must be the smallest unindividuated parts to the cosmos in which we find ourselves. We hope and pray that we do not find a mere figment of our imaginings. That we are not left hopelessly in charge of our reality. Even as so many of us still fight to take over God's prerogatives. Especially those who say they worship at that Name. To be sure, I am no believer in any God that can be named. So don't get worried that I would like to spring on you some new religious fanaticism. I am talking purest science here, of the sort which requires no new experimentation, but which, in proper theory, resolves all the data which we already fully have in our possession. This is the day when I must call the realtor, the lawyer, the water test company and order up my storage pod, so this is the day beyond which I will have no more time to write. Just as on that day those many years ago now, when I had run through all my money. When I had spent perhaps a week with seemingly terminal diarrhea and vomitting, sleeping in the hull in its cradle up on land in the boatyard among all the other abandoned husks. It was toward the end of the summer and everyone else with viable boats had been sailing the full long season. I would sneak out each night to empty my body's stinking load. And in the morning white-haired Nick, whose hair had turned that way one single night in Viet Nam, would climb my ladder to see if I was still breathing. He would later agree to come out sailing, and I consider it my proudest moment that, while heeled over with waves coming in over our rails, he never did panic although he'd said he would. And then finally, they nearly dropped it, lowering my boat into the small creek from maybe 50 feet in the air, or so it seemed. The old crane had a clutch worn shiny, and it would slip and catch, in mockery of my heart. The water poured in through the stuffing box which I had neglected to tighten. And then we motored out, Dad and I - he had driven to Connecticut from Buffalo from some truly strange compulsion, since there was only a shaking head in response to my ridiculous project - to pass under the low railroad bridge as the tide was reversing its flow, giving us scant time to race out into Long Island Sound. At full tide, there was no room for even the boat to pass under that bridge. And as I watched my long wooden mast being lowered into that hull, there were four or five boys in line along the railroad bridge, waiting for the train's whistle to test their courage. And still today I see that final boy's face, whose toes still touched the tie beyond the moment when he could force his body to be more horizontal. The whistle would have drowned his screams. Gravity won, thank goodness. That is the face I wear today, internally. When I first raised my jib, I had to crawl on my belly out the bowsprit. I later learned to stand with but a finger touching the forestay, bounding into whatever weather, the boat and I all one. And Dad will soon be moved to a memory unit in the home where he now lives. He wonders "now, where did you go to school" though only weeks ago he would brag to my Mom's mortification, about how many times I'd dropped out of Yale. And Mom finally wants nothing more to do with him, which is her triumph in the end. He was that verbally abusive, and bound her to his money. So, this will be my last salvo for a little while. This desperate claim that I have something to say that you should want to hear. What I have to say is trivially simple. There is no need to look for arcane mechanisms in the brain to prove the quantum implications of our thinking. I'm not saying it wouldn't be interesting, and that I won't want to read about them when they're found. But already we can understand that emotions are real and not just some distraction from what's hard. Already we can admit that these are the true organizing principle to what it is that we can resolve with our instruments, no matter how cleverly or massively or orbitally deployed. No matter how much energy we inject into their production. These emotions are what turns our attention this way or that, and not, by far, some merest accident. Because at the farthest remove from our control is always accident. That's what we mean by random. But what gets held close, what informs our dumb and stupid matter to something approaching life that we can love, that must be informed by something better than accident. Something more than random. When we destroy the life by too much design, it will inevitably leave us. When we approach it with love, it will return that love with the same reward which my old wooden sailboat has returned to me, while underway and powered by just this freest wind. So, I am done with bodily pleasures. I have no more need to smoke or drink or eat the bloody stuff (though, trust me, I won't refuse it when it's offered, well, except for the cigarettes - they're just gross). I'm done with passions directed toward things. I'm reentering the world as naked as they day when I was born, and born and born again. Hello World (I've always wished I could be that much of a programmer too, come to think of it)! You see, the thing is that you've already responded to me, dear reader, and so I don't feel all that alone any more. I'm OK with how much longer it still must take to get it right. I'm pretty sure I can make my simple argument hold water. And then we can go sailing, you and I, across the ether. Which also, by the way, doesn't really exist, as has been proven now over and over again, except in the mind as blankest conceptual space between all the hard stuff. It's the emotional connections which count to set our direction, and not only the magnetic compass. You need an extra approval widget above, named "phenomenal." I agree with drkoepsell. I think you are phenomenal...Guess who found you? ?